Today saw the first set of games for the P4s since early December 2015 – something like 10 or 11 weeks ago! The coaches were intrigued (and somewhat nervous) to see how our lads would be after such a long lay-off, and whether it would take them time to get back up to speed. Well we needn’t have worried! Indeed, the whole squad has come on hugely and there was some fantastic rugby played by every one of the players. I think we all saw the benefit of the indoor training facility today. 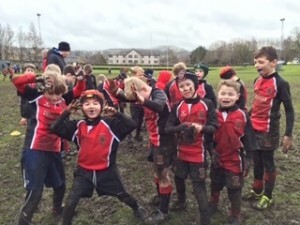 We have trained every week over the winter period, despite the horrendous weather, and the skills and technique of all our boys were noticeably better than they had been in our last round of games. It has been frustrating at times training indoors on half of a small pitch, however it is now clear that any training is better than none. We had teams visiting from Stewarts Melville, Musselburgh, Murrayfield Wanderers and Melrose today. Once again we were in a position where we could have fielded three Linlithgow teams (including subs for each team) if we chose to. That is a fantastic position to be in and is only achievable due to parents bringing the boys along week in week out. The only reason we didn’t field three teams today is that it would have resulted in a match schedule that would have dragged on, therefore the decision was made to only put out two Linlithgow teams. I can only speak for my own team, but we started with a game against Musselburgh, which we won relatively comfortably. We then went on to beat Stewarts Melville in a game that was closely fought and a times very physical. Finally we played Melrose, which ended up in a 4 – 4 draw after some fast and exciting rugby. There was a small bit of controversy at the end of the game when a Linlithgow try was disallowed by the referee, even after he had asked the crowd for their opinion, however all in all a draw was probably a fair reflection of the game. The highlight of today was that this was genuine team effort. At times in the past we have relied on a handful of players to do the work, particularly tackling. Today that was not the case and every one of the boys got stuck in and worked hard to make their tackles. 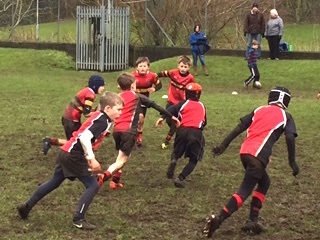 We also saw some of the best attacking play and passing that we’ve produced to date, and at times the boy’s offloading and handling skills were exemplary – the fact we scored 15 tries today and only conceded 6 says a lot about our defence and attack.